Chances are, if you have had your driver’s license for more than a few years, you have probably been involved in an accident of some kind. According to the Texas Department of Transportation, there are about 13,000 serious vehicle accidents annually in our state alone. Out of those accidents, nearly 17,000 people will suffer injuries that are severe. In most cases, when people are involved in a car accident, their injuries can be identified fairly easily. 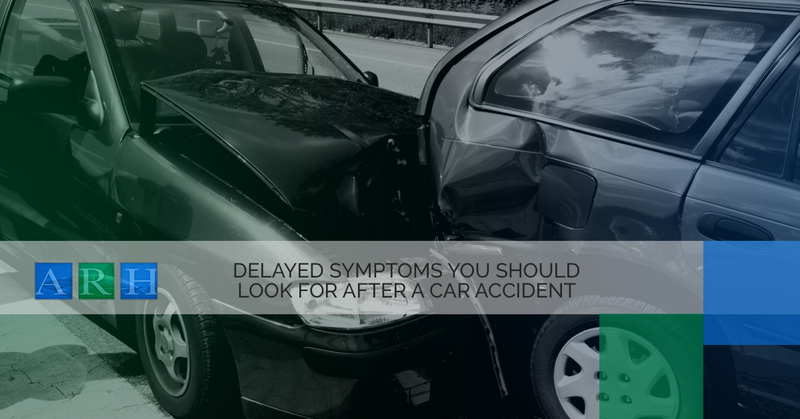 On the other hand, there are some symptoms that will not show themselves immediately that could turn into a serious problem in the long run.The best way to avoid learning that you have had a serious injury when you don’t have symptoms, is to always have a medical examination when you have been involved in a car accident. Headaches are not something to ignore. While you may have gotten a headache every now and then before your car accident and simply brushed it off, after being involved in a collision, we wouldn’t recommend having such an attitude. If you find that you are experiencing a headache a few days after your accident, this could mean that you have a concussion. Additionally you may be suffering from a head or neck injury or even a blot clot. If left untreated, these sort of symptoms can lead to a serious condition, or in some cases, death. Back pain may be serious. While most people will experience some degree of soreness after a car accident, noticing that you have a good amount of back pain after a collision could be an indication of something more serious. In fact, you very well may have sustained an injury to your vertebrae. If you find that your pain is moving into your arms and legs as well, you should see an orthopedic doctor as soon as possible. Spinal injuries can be detected quite easily when you get an x-ray, CT Scan or an MRI. We all know what it feels like to be bloated. However, after a vehicle accident, bloating or swelling of the abdomen can be a sign of something that is seriously wrong internally like internal bleeding. If this is the case, you may also find that you are dizzy or that you have been having fainting spells, you may be experiencing a life threatening situation and should go to the hospital immediately. When someone suffers from a traumatic brain injury, the signs may not show themselves for quite a while. Often, it takes someone else noticing these symptoms before people will seek help. If you or someone you know has been involved in a car accident and you notice a change in personality, emotional responses, or physical function, it is likely that a traumatic brain injury is to blame. It is not uncommon for someone to experience post-traumatic stress disorder (PTSD) after they have been involved in an automobile accident. If you find that you are experiencing anxiety when you are getting into a car or you simply refuse to drive at all, you may be suffering from PTSD. Harmed in a car accident? If you have sustained injuries in a car accident, whether they be internal or external, you need to seek the help of an experienced personal injury lawyer. Not only can an accident attorney help you to get the compensation you need to cover the cost of things like medical bills and work days missed, but they can also be a source of support as you recover during this difficult time. If you live in Victoria and you are in need of an personal injury lawyer, contact the Law Offices of Alex Hernandez Jr. right now! We can help you!